Well, if they say that print is dying than catalogs must be a thing of the past… but not really. While many catalogs are no longer printed but available in digital format, the concept behind them continues to hold A LOT of value in marketing. In many cases, catalogs are no longer considered part of the selling channel yet they still hold value in sharing in depth details about products and services. This survey had great answers to why companies (both B2B and B2C ) still use them in targeting customers. The 2014 Multichannel Merchant Outlook Survey reported that ecommerce websites at the top channel through which merchants market (90%), followed by social media (87.4%) and email (83%). Still 51.7% of retailers that responded said they do use catalogs to promote their brands. – Get the full report coverage here. So unless you have a limited breadth of products where a direct mail campaign would be more appropriate, acquiring customers with catalogs statistically increases response rates, average order size and drives repeat purchases. The top three answers for catalog usage today are mobile traffic driver, customer retention tool and web traffic driver. Catalogs also have a renewed purpose in prospecting. More than three-quarters of merchant respondents said catalogs were a top choice for their prospecting strategy in the next 12-months. And more than 52% of companies planned to increase their catalog circulation by up to 20% in 2014. The style and size of catalogs are changing too. While the number of pages have dropped dramatically in the past 10 years, the page counts seem to be leveling off with more than half of respondents expecting catalog page counts and frequency of distribution to remain the same from last year. It’s not all about quantity of pages though, some companies are selecting better paper quality and creating a tactile experience. QR codes also hold value in catalogs, more than half the merchants use them. The codes mostly linking to a product page (54.8%) or video (13.7%). But do these changes really make catalogs effective? YES! A little over 66% claimed key code capture proved effectiveness and over 60% used a match back program. Often catalogs are part of a multimedia program targeting customers which makes true evaluation for each mailing difficult. Catalogs are also adapting to digital formats – allowing users to easily find what they saw in print and more. Some choose to only offer a PDF digital version that customers can zoom in, share on social media and have one click shopping. The fact remains that customers need prompting to purchase and catalogs are a good format for prospecting sales and driving traffic to a website. 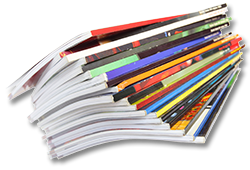 Do you still find a benefit in providing a catalog for your customers? How have you changed the role of catalogs in the marketing mix? A marketing communications professional helping other marketing professionals, business leaders and marketing students gain a better understanding of trends in advertising and public relations as well as tips for being a successful marketer. What makes the Perfect Post?